The Holy Grail of Fudge! | ARTZCOOL'S BLOG! The Holy Grail of Fudge! At our house, like any house, we have our favourite foods, fruits and vegetables, and also we have our favourite unhealthy and fattening foods. Today’s post falls in the unhealthy category. I really do have to apologize in advance for sharing this recipe with you… this is by far the best tasting fudge I have ever made, but it also the easiest….OK, I have warned you, so my conscience is clear…enjoy! 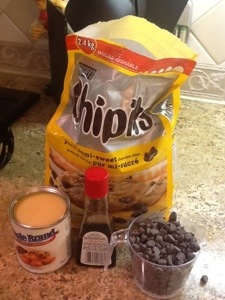 Start by melting 2 cups of chocolate chips. I melt mine in a double broiler, but you could also use the microwave. 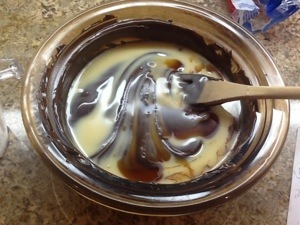 Once the chocolate has melted, slowly pour 1/2 can of the condensed milk into the chocolate, ad add 1tsp of vanilla. Keep on the keat, stirring as you mix. 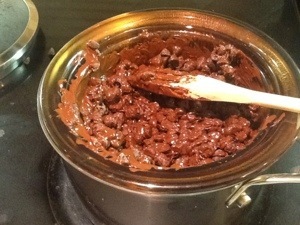 If you do this too fast, it will cool the chocolate and harden it while you are trying to mix. As it is, you have to work fast. 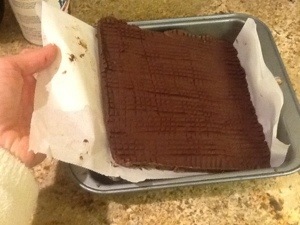 In a 9×9 pan, line it with parchment or waxed paper, and pour the fudge in. I used another piece on top to help flatten it out. I used a fork to score the top, not for any reason other than I like the way it looks. 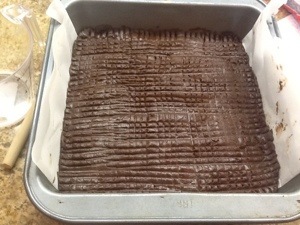 Let the fudge cool for about 1/2 hour in the fridge, if you can wait that long! 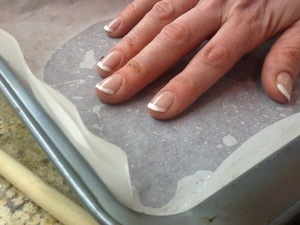 Then take it out of the pan using the waxed paper. And enjoy. 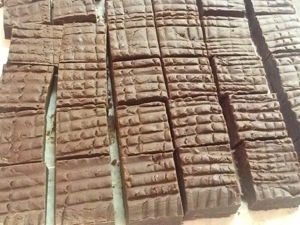 You should keep this in the fridge, I am going to try to freeze some of it…this much fudge is my fridge is dangerous! I used a left over sushi tray to store it. 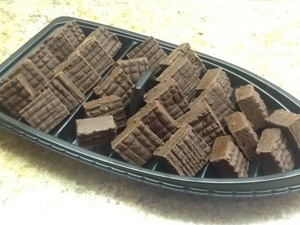 I call it my Fudge Boat Supreme! I know I have been saving those sushi containers for something!